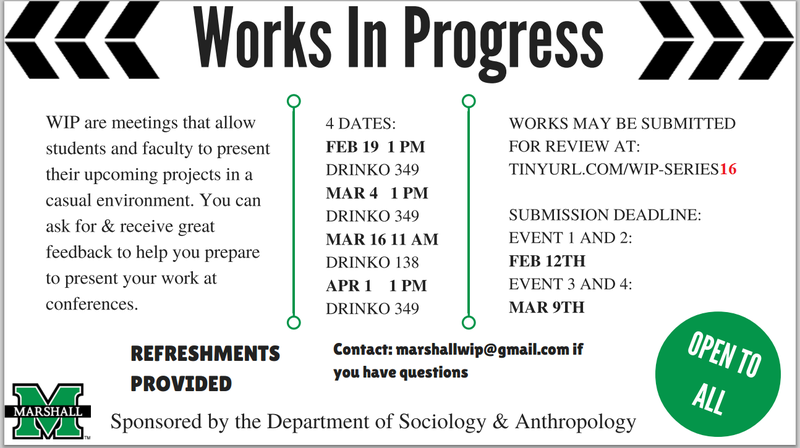 Originally at the initiative of Dr. Brian Hoey (Anthropology) and developed by the student organized and led Anthropology Club, the Department has had series of student and faculty Works in Progress presentations since 2013. The purpose of the series is to provide a regular time and place for undergraduates, graduate students, and faculty to present works in progress and receive helpful feedback. These gatherings enable both students and faculty to interact with one another in an informal manner in order to develop research projects, foster public engagement, and encourage publication. Typically, presenters are given between 15-20 minutes for their presentations and approximately 10 minutes for feedback (including questions) from the students and faculty in attendance. This allows us to schedule two presentations within an hour-long session. In the past, we’ve had up to three presenters during “crunch time” before a scheduled conference. Longer presentations may be arranged with the series coordinator (see contact below). Please stay tuned for updates as to future events when the WIP Series begins again. Presentations are open to everyone. Any Marshall University undergraduate or graduate student, faculty member, or alumni. We do ask that presenters frame their work, if it is not already, in terms that speak to the topical concerns of interest in the liberal arts and sciences, generally, such as those typical to anthropology and sociology, specifically. You betcha. We have snacks and drinks for you–including Starbucks coffee! ‘Nuff said. 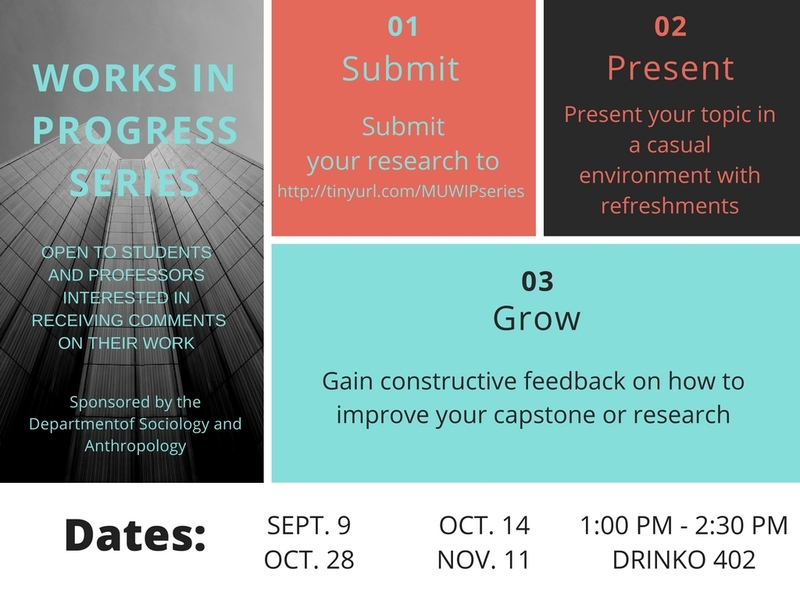 If you would like to submit a proposal for presenting at the WIP Series and getting valuable feedback on your works in progress, please see the submission portal here: https://tinyurl.com/MUWIPseries. For information, please contact the WIP Coordinator . Arrangements should be made at least one week before the day of the presentation. You will need to provide a title for the presentation as well as an abstract to the coordinator that describes the paper (and/or research) that you’re working on. You should also have a graphic (including source information or credit) for the WIP Coordinator to include on the promotional flyer that will be produced to advertise the event. All of this must be submitted via the Submission Portal (see above). Please note that this is a work in progress series. This means it is understood that work being presented is not finalized. You are presenting, at least in part, to receive feedback in order to further refine that work with the goal of presenting in a more formal setting and/or seeking a venue for publication. As abstract writing can be a challenge for many, you may want to refer to a rather helpful set of guidelines from the Southwestern Anthropological Society. Though intended for students submitting abstracts for the society’s annual conference, it is still generally applicable and useful for our purposes. See the streamed video for this session. See the streamed video of this session.